Your Haverhill business can have the vending machines it wants, installed for free, from American Food & Vending. Vending machines boost morale and can save you money. Employees will appreciate the convenience, and will not have to leave your Haverhill business to get the food or drinks they want. There are all kinds of vending options, and you choose what you feel will best fit your particular needs. We will install them, fill them, and maintain them for you. 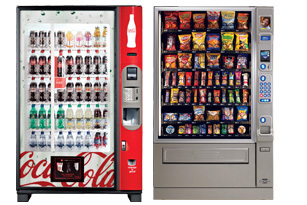 Your Haverhill Company can have vending machines loaded with Coca Cola products, Pepsi Cola products, candy vending machines, snack vending machines, coffee vending machines, vending machines with hot or cold food items, and vending machines with nutritional food and beverages that are low in calories, fat, and sodium. Tired of lugging those big five gallon water jugs? They are heavy, hard for most to place on the cooler, and take up too much space! American Food & Vending can install a water filtration system to eliminate those cumbersome water bottles. Tied into your existing water source, our filtration system will give you an endless supply of clean, clear, great tasting water! This, by the way, will help you make great tasting coffee at your Haverhill office! American Food & Vending can keep the break room fully stocked with coffee, filters, teas, hot chocolate, cups, napkins, stir sticks, sweeteners, and creamers. No more hassling with having somebody take care of the break room shopping. No more complaints about missing items and poor quality coffee. Our uniformed, professional staff will take care of everything! 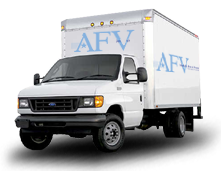 Just click on our “contact us” tab on our website, or call us at (800) 553-2222. Let’s start a great business relationship today!